Blepharitis is a condition that affects the eyelid margins. In fact, the eyelid margins become swollen & red when someone is affected by the condition. The condition can affect a person at any age, and any man or woman can be affected by the illness. The main symptoms of the condition include sore, itchy, a burning sensation in the eyes, red eyelids, increased sensitivity to light, abnormal growth or loss of eyelashes, and greasy eyelashes. This read offers information on some of the best blepharitis treatments. Be sure to check out http://www.dryeyesclinic.co.uk/BlepharitisTreatment for more information. Blepharitis is quite common in the world where millions of people are affected by the condition each year. In most cases, one eye could be affected while there are cases where both eyes are affected. The symptoms of the condition tend to be more severe in the mornings. You need to see a qualified eye doctor if you have persistent symptoms of blepharitis. If these symptoms cannot be controlled by day to day eyelid hygienic methods, you should definitely consider visiting an eye doctor. Blepharitis is a long-term condition where most patients experience repeated episodes. These episodes can be separated by periods without any symptoms. Although the condition cannot be 100% cured, a proper eyelid cleansing routine can help control the symptoms and prevent permanent scarring. There are three main steps that you need to perform on a daily basis to keep your eyelids clean and get rid of the symptoms of the condition. Using a warm compress is one of the most important steps in this regard. It will make the oil production glands around your eyes runnier. You need to gently massage the eyelids to push the oil out of the glands. The final step is to clean the eyelids so that any excess oil, crusts, grime, dust and bacteria are wiped away. 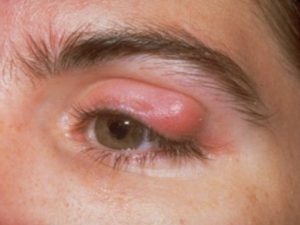 More severe cases are treated with an antibiotic ointment that is applied directly to the eyelids. Some doctors will prescribe an oral antibiotic course if the condition is severe in nature. There are so many other effective natural blepharitis treatments such as tea tree oil, castor oil, and omega-3 fatty acids. Tea tree oil helps treat the underlying cause of the condition and reduce its symptoms. Mix 3-4 drops of tea tree oil is a tablespoon of olive oil. Dip a cotton swap in this mixture. Close the eyes and place this swap over your eyelids for 5-10 minutes. Repeat the treatment twice a day until you see positive results. These are some of the best treatments for blepharitis.